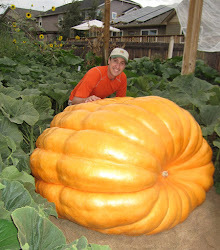 Today I lifted the 1685 pumpkin. Measurements are bigger than the 747 pumpkin, but we'll have to see if it weighs more. My guess is that it goes light. Big thanks to the team at Power Equipment Rental in Heber for the equipment. Used the telescoping fork to lift the pumpkin and then used the Kubota tractor to put compost into both patches. When I asked if the had a tiller attachment, they said no and then went out and bought one for me to use. They even supplied some very nice compost. So a BIG thanks! I put down grass clippings from the lawn that I saved all summer, elemental sulfur, yards of compost and some 8-2-1 fertilizer. That big Kubota made nice work of the soil. Three swipes in the smaller patch and it was done. Also used the Kubota to till the entire backyard in preparation for putting in a lawn the spring. Tomorrow or the next day I'll put in a cover crop of winter rye into both patches. I was hoping to do it today, but was working the soil until past sundown.